Not exactly a great capture of the wrap but as a photograph I found this one interesting. I cast on for this wrap in June. It didn’t see prime knitting time until after Christmas, though. I’d pick it up and knit a few rows here and there, between projects or when I needed mindless garter stitch. This was knit was a simple one for me — not only is it basically all garter stitch, but this is also the third time I’ve followed the Gardiner-Terhi path. (It’s not quite a pattern, it’s more of a variation of a variation of a pattern. Or something like that.) This time, though, I threw in (what felt like) a wrinkle of my own. Instead of making this one envelopingly large, I made this one smaller. I quit the main section about 3/4ths of the way through, and I knit about 2/3rds of the called-for tail section before switching colors. I measured the contrasting color section in inches rather than in rows (to be nearly the same length as on the larger one) since I used a heavier yarn for that section this time. Today, I need to work on a crocheted hat, and if I get that done I’ll probably give my first entrelac project a bit more time. Check out the Fiber Arts Friday roundup at Wisdom Begins in Wonder to see what other people are crafting this week. Also: See a roundup of other people’s finished objects for the week at Tami’s Amis. This entry was posted in knitting and tagged fiber arts. Bookmark the permalink. Pretty. I’m thinking my next project should be a shawl, I still haven’t managed to finish one yet. Pretty… and I do like the artistic photo! 🙂 Happy FAF! I love it – it’s so cold here and that looks so warm! Whenever I see a finished wrap/shawl laid out like that I just never know what I would do with it, but you wear it so beautifully!!! Ha, thanks! I actually do wear them. I love the colours you chose for this, they’re so warm-looking. It looks lovely on you, too, I really like the drape. Oh, thanks! 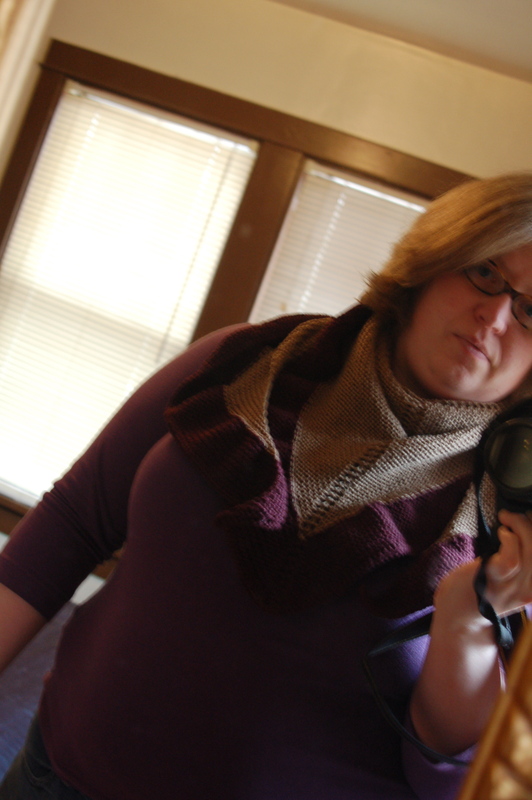 The drape *is* great, I think; it’s not overly warm because even though it’s garter stitch, it’s worked at a pretty loose gauge, and it’s 100% cotton (from old super-soft sweaters). Beautiful shawl. I would have a hard time knitting a shawl in the summer. This time of the year is perfect. Well, a quick hat should be a nice change of pace. I am actually finishing a hat after my big cowl then I’m taking my sweater out of time out. If I work it right, I might actually finish it so I can wear it this winter. Oo, I love this! the colors will look great with almost anything. That’s actually a huge reason why I chose them for this. 🙂 And thanks. Pretty! It’s nice to see another variation. 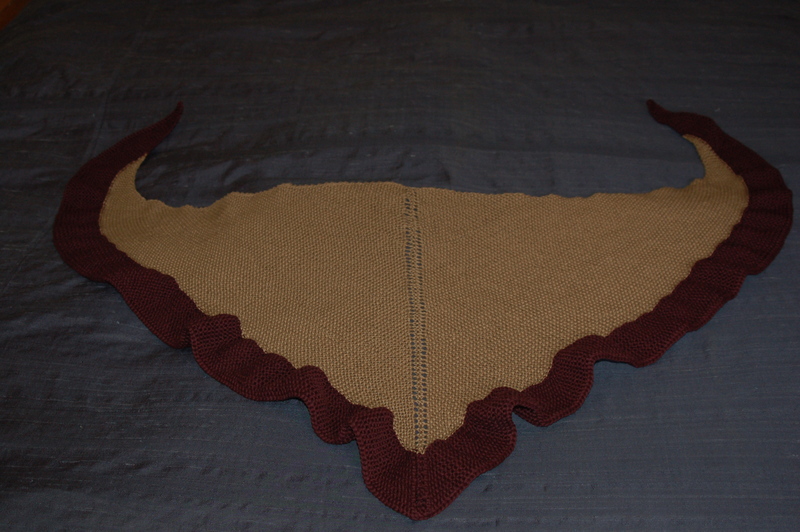 I’m working on a similar shawl and it is wonderful mindless type knitting. I’m planning on having it done in time to wear it at work this summer when the a/c is cranked down and I’m freezing in my office. Nice interpretation. It looks great as a scarf. Happy Fiber Arts Friday! Oooh, pretty! I actually found your site because I’m a book review blogger, but I knit as well. Are you on Ravelry?